Uganda cranes coach Moses Basena and ex-captain Ibrahim Sekagya share tactics during training at Namboole. Photo by Shaban Benteke. 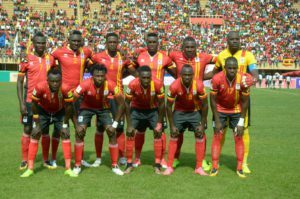 Uganda Cranes coach Moses Basena has named a squad of 20 players to travel to Alexandria Egypt for the fourth game of the 2018 World Cup qualifying campaign. Uganda tops Group E with seven points, one ahead of Egypt who they face in a return leg on Tuesday. Ghana are third in the group with Congo Brazzavile trailing the group. Captain and goalkeeper Dennis Onyango who made world class saves on Thursday at Namboole as Cranes edged The Pharaohs 1-0 thanks to an Emma Okwi superb goal will lead the troops. The squad set to fly out of the country on Sunday morning has three goalkeepers, including Isma Watenga and Benjamin Ochan with Ethiopian based Robert Odongkara dropped. The final squad was released after a training session on Saturday morning at the Mandela National stadium, Namboole. Out field players: Nico Wakiro Wadada, Godfrey Walusimbi, Isaac Isinde, Murushid Juuko, Wasswa Hassan Mawanda, Khalid Aucho, Emmanuel Arnold Okwi, Faruku Miya, Derrick Nsibambi, Joseph Benson Ochaya, Bernard Muwanga, Ivan Ntege, Muzamiru Mutyaba, William Luwagga Kizito, Milton Karisa, Isaac Muleme and Geoffrey Sserunkuma.